Wall St. Fever online slot machine pictures and slot feature list from Playtech, play Wall St. Fever Slots for free. Wall St. Fever Slots has not been reviewed yet, be the first to rate this slot. Wall Street Fever comes with 5 reels and 5 paylines. 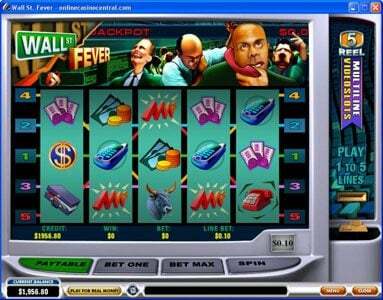 It offers a progressive jackpot and incorporates Free Spins, as well as scatter and wild symbols. Most people know what Wall Street is and the amount of money that circulates there on a daily basis. That’s where you will find some of the biggest financial companies in the world, and they got a lot of attention over the years, mostly of the negative kind. That area fascinates people and this Slot Machine tries to capitalize on the attraction of Wall Street and money in general. The classic look for a Wall Street trader is that of a guy in a huge noisy room, yelling numbers at other brokers and talking on the phone all the time. It’s an image that’s not modern, so Playtech decided to keep the game a bit retro, with an 80’s feel to it. As one would expect, the symbols used in this Slot come from that environment of stocks and trading, with icons including signs of Wall Street, cell phones, red fixed landlines, slips, briefcases, bulls, cash, monitors and dollar signs. One other item that will attract your attention is the jackpot progressive counter, placed on top of the reels, and looking just like a ticker would on Wall Street. This slot machine accepts bets of up to 5 coins, one for each line, with a fixed coin value of $0.10. As for the betting range, it goes from $0.10 to $0.50. Each time a player spins the reels on this machine, a percentage of the money he wagered goes towards the progressive jackpot. In order to get the maximum amount of money, the player has to wager the full amount possible, so the bet has to be placed on all the lines. The jackpot is won when all 5 of the symbols of Wall Street show up on one of the active paylines. There is also a feature where the player can get free spins, which happens when he gets at least three symbols with free spins on them. The more symbols he gets, the more spins he receives for free. Since the Free Spin symbols are scatters, they can show up anywhere, not just on one active payline. A slot about Wall Street should make plenty of people want to try it out. While the graphics are not the best you’ll see in a slot machine, they’ll do the job, and the progressive feature can make you rich, just like Wall Street if you’re lucky.